The Annual UCSF LGBTQI Health Forum is a unique, student-organized program that provides attendees the opportunity to learn more about the health care needs of the LGBTQIA+ community and become better prepared to serve LGBTQIA+ patients in the clinical arena. Established ten years ago in response to global trends and national reports showing disparities in LGBTQIA+ health care, this one day, 10-hour event, provides not only a rich educational experience, but a critical networking opportunity for students in all disciplines of health care. The forum attracts over 300 inter-professional health students and continues to grow every year. We, as healthcare providers and researchers, firmly believe that in order to collaborate in inclusive and patient centered care with our LGBTQIA+ patients and communities, we must have a deeper understanding of their experiences beyond their sexual or gender identities. Through our programming, we want to highlight the incredibly diverse LGBTQIA+ community and uplift the voices of those further marginalized due to their other identities such as race, ethnicity or ability. We come to the table eager to learn from and with the LGBTQIA+ communities we seek to serve while also celebrating and honoring their strength, resilience, and innate ability to heal. The Forum is a collaboration between the UCSF LGBT Resource Center and the LGBTQ Student Association. 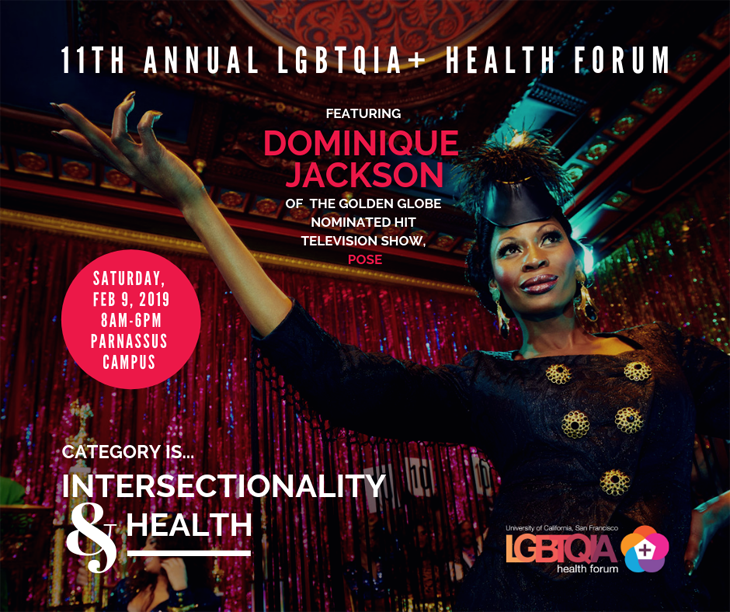 The 11th Annual LGBTQIA+ Health Forum will take place on Friday & Saturday, February 8-9, 2019. More details coming soon.